From the kitchen of One Perfect Bite... Easter and Passover will soon be here and I wanted to make sure I posted holiday recipes in time for your consideration. At Bob's suggestion, I'm going to begin with breakfast or brunch dishes that are unusual or will make entertaining a house full of people easier. I have two recipes to share with you today. One of them is a decade old recipe for popovers that was developed by Pam Anderson. Her recipe is unusual because it uses instant blending flour and that eliminates the wait time that is necessary to relax the gluten in all-purpose flour. That means that you can mix and bake popovers and have them on the breakfast table within an hour. You're probably familiar with the instant blending flours and use them for browning or thickening soups or stews. This type of flour goes through a special milling process that gives it a granular form that is much like sugar. It's perfect for sauces and gravies because it dissolves easily in liquids. Some restaurants use it to help brown meat. It can also be used for batters, quick breads, muffins and cakes. If you haven't had popovers for a holiday breakfast or brunch I hope you'll give them a try. They are really easy to make and when served warm with a fruit butter they are a real treat. The second recipe is for a strawberry butter that is a perfect accompaniment to the popovers. It, too, is easy to make. Here are the recipes. 1) Adjust an oven rack to lower middle position. Preheat oven to 425 degrees F. Spray a 12-cup muffin pan or cups of 2 popover pans with vegetable cooking spray. Set aside. 2) Mix flour and salt in a medium bowl. Mix eggs, milk and butter in a 1-quart measuring cup. Beat egg mixture into flour mixture until batter is smooth. Return batter to measuring cup. Return batter to 1-quart measure and pour into prepared cups, filling each three-fourths full. 3) Bake, without opening oven door, until popovers are crisp and golden, about 35 minutes. Twist gently to loosen from pan, then cool. Yield: 8 to 12 servings. Beat butter and cheese in a small bowl until smooth and creamy. Add sugar and strawberry puree and beat to combine. Transfer to a 1-cup ramekin. Cover with clear plastic wrap and refrigerate until 30 minutes before serving. Yield: 1 cup. Strawberry butter..that would be so good! My thoughts exactly, Strawberry butter? YUM. Yummy. Thank you for sharing. Love this. Happy Pink Saturday and a wonderful weekend. Ooh delicious, I have never heard of strawberry butter before. 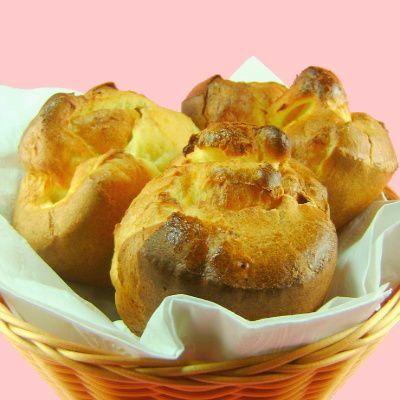 Popovers are yorkshire puddings here in England and more commonly enjoyed with the beef sunday roast, the idea of having them for breakfast definitely appeals though! Delsh n delight full...i was making strawberry butter all this time with philly cheese n my home made chunky strawberry preserve all this time w/o knowing i cud cl it strawberry butter :-)))) n then saw it in a few places in blogosphere but by far ur pics is the best n it goes so so well with ur amazing pop overs...at the rate i bookmark ur absolutely amazing recipes i have to go on a delicious binge .....love all ya recipes sweets!!! Mmm...The restaurant at Neiman Marcus here has a wonderful popover w/ a strawberry guava butter and this reminds me of it. Looks delicious! O, Mary...I can't figure out how I have cooked for so long and not heard of so many things. This flour....I've never heard of it. I wonder if it's at our supermarket..I've never seen it. I LOVE popovers so much, I could marry one! And with Strawberry Butter...OMGosh...HEAVEN. As always so delightful to come here and visit. 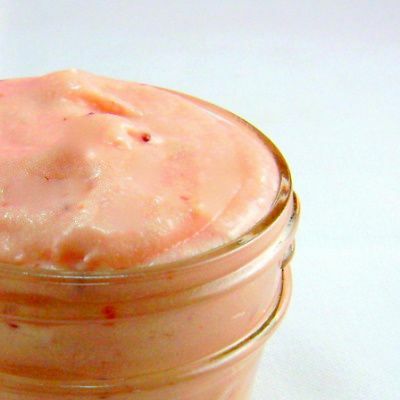 This strawberry butter looks absolutely scrumptous. OMG I can just see myself spreading some on one of those biscuits. Oh thank you for sharing this beautiful day and recipe with me. I actually heard about this Wondra flour for the first time just yesterday on the food network. Those popovers look delicious. But that strawberry butter...fantastic. Such a simple way to make brunch extra special. Emmm.. yumm... Another yummy recipe! The strawberry butter looks sooo cool. I bet it tastes wonderful! Swooinng in visual pleasures and from hunger pains- these look marvelous. thanks for the recipe! "Do these shoes match this purse? You're sure putting out some good sounding baked goods lately. Mary, popovers are a big breakfast favorite and I am sure that with your incredible strawberry butter; they'll be even better. Haven't made popovers in a very long time -- yours look so yummy, and the strawberry butter -- wow! Popovers are a favorite and your suggestion to use Wondra is such a timesaver. I would love to reach into the screen and take one of those gorgeous popovers right out of the basket. I've never heard of instant blending flour, I think I may have seen 'sauce flour' before, so maybe that is it. I wonder if cornflour would work? Anyway, I wont be having a house full of guests for Easter, so no need to fret! I'm always learning something new when I visit your blog! The popovers and especially the strawberry butter look and sound wonderful!! I love popovers and recently started making them myself. They are so simple and so beautiful! Love the strawberry butter. Oh yeah! Just like Nieman Marcus! I love their popovers and strawberry butter. Nice to have recipe for it as well! time goes so quickly and not enought time to do lots of to do recipes from you list... I've been planning on doing the strawberry butter since years, and never got the time. what a great breakfast, I bookmarked your recipe to try the butter. Just stunning! Pop overs can be tricky to bake and yours are just beautiful. A little strawberry butter with a couple of these popovers and a cup of coffee would be wonderful. Thank you so much for your comment-so kind. I love you blog- One perfect bite is a motto my husband and I share- everytime we want to share each others dish when we are eating out we call it 'making the perfect bite'. Mm, sounds like a wonderful spring treat. I have never used blending flour - good to know its uses! Mmm, that strawberry butter sounds wonderful! I've never made popovers.. this looks like an easy recipe... will have to try them! Oh, yummy, these look delicious! Your photography is wonderful! Thank you for sharing. I love popovers - and have been thinking about making them again after a long time away. I first tried them at Jordon Pond in Acadia, ME and fell in love. WOW STRAWBERRY BUTTER THATS SOUNDS SOOOOOO YUUUMMMMYYYY FOR MY TUMMY.....LOL I LOVE STRAWBERRYS!!! THANKS SO MUCH FOR DROPPING BY MY BLOG....I NOW FOLLOW YOU!!! Oh wow! I love that strawberry butter -it's gorgeous! I have been hearing a lot about Wondra flour lately. I definitely plan on buying it very soon! Oh my those sound so good! I had never heard of Pink Saturday until now! So I will have to keep it in mind. Thank you for posting on my blog. Between all the snow and being in ER all morning it has been quite a day! i love the second photo, nice shot, looks yummy too! Love popovers and don't know what I'd do without a popover pan! (And I'm not much of one for special pans). What a divine post! I haven't made popovers in years, but you've inspired me. Thanks for commenting on my first Pink Saturday post. I will admit that I have never used instant blending flours, but you have convinced me to try. Love the sound of strawberry butter. Perfect for Easter! I never ever knew that Wondra could be used like this. Terrific! And bring on the strawberry butter!!! Hope you had a lovely Pink Saturday. I love Strawberry Butter and I haven't made it in so long maybe I'll make it today. It would be a nice thing to enjoy on the weekend!! Wonderful post! I bet the strawberry butter is to die for!! Love this! I really need to just bite the bullet and buy myself a popover pan. Every time I see them, I want to make them and rue my popover-pan-less existence. Strawberries are my favourite. I am going to try this with your gluten-free pancake recipe. Thank you. Happy Pink Saturday! I am still making HPS rounds,probably will take till next Saturday! Happy Belated Pink Saturday! PS I am having a blog giveaway! Looks so delicious!! Oh my all your posts look delicious. I love your blog and am now you newest follower. Can't wait to see what you are making next!